But since the end of World War II, all important innovations and trends in American music have sprung from the 'grass roots' of our nation. 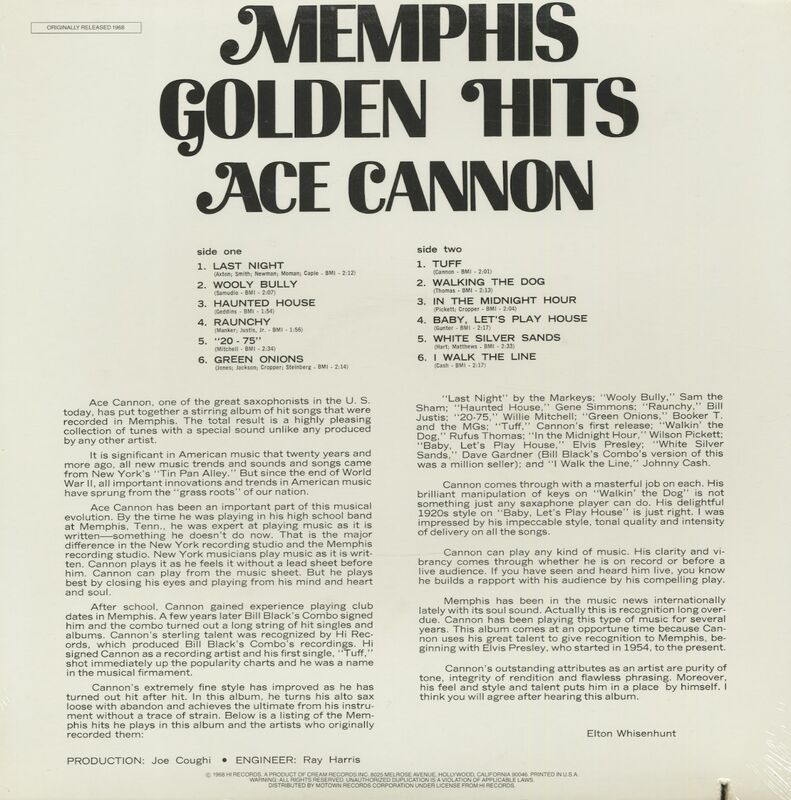 Ace Cannon has been an important part of this musical evolution. By the time he was playing in his high school band at Memphis. Tenn.. he was expert at playing music as it is written-something he doesn't do now. That is the major difference in the New York recording studio and the Memphis recording studio. New York musicians play music as it is written. Cannon plays it as he feels it without a lead sheet before him. Cannon can play from the music sheet. But he plays best by closing his eyes and playing from his mind and heart and soul. 'Last Night' by the Markeys: 'Wooly Bully,' Sam the Sham: 'Haunted House,' Gene Simmons; 'Raunchy.' Bill Justis; '20-75.' Willie Mitchell; 'Green Onions,' Booker T. and the MGs: 'Tuff.' Cannon's first release: 'Walkin' the Dog.' Rufus Thomas: 'In the Midnight Hour.' Wilson Pickett: 'Baby. Let's Play House.' Elvis Presley; 'White Silver Sands.' 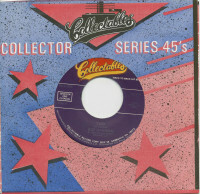 Dave Gardner (Bill Black's Combo's version of this was a million seller): and 'I Walk the Line.' Johnny Cash. Cannon comes through with a masterful job on each. His brilliant manipulation of keys on 'Walkin' the Dog' is not something just any saxaphone player can do. His delightful 1920s style on 'Baby, Let's Play House' is just right. I was impressed by his impeccable style, tonal quality and intensity of delivery on all the songs. Cannon can play any kind of music. His clarity and vi-brancy comes through whether he is on record or before a live audience. If you have seen and heard him live, you know he builds a rapport with his audience by his compelling play. Memphis has been in the music news internationally lately with its soul sound. Actually this is recognition long over-due. Cannon has been playing this type of music for several years. This album comes at an opportune time because Can-non uses his great talent to give recognition to Memphis. beginning with Elvis Presley, who started in 1954. to the present. Cannon's outstanding attributes as an artist are purity of tone. integrity of rendition and flawless phrasing. Moreover. his feel and style and talent puts him in a place by himself. I think you will agree after hearing this album. 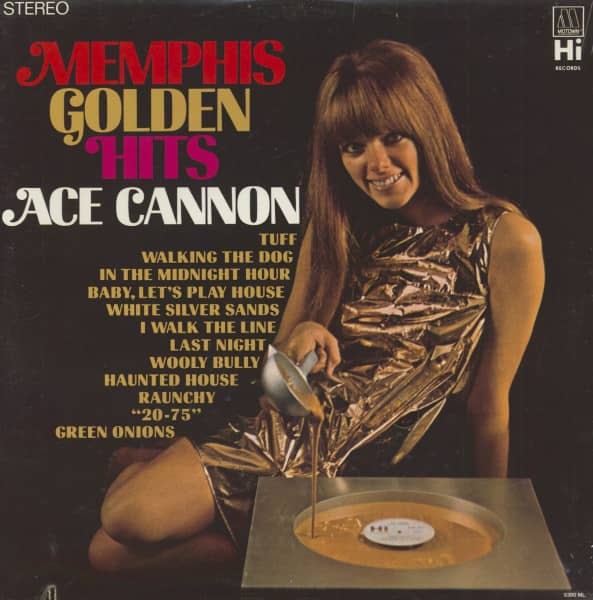 Kundenbewertungen für "Memphis Golden Hits (LP)"